Four narrators. Two books. One story of love. Side A tells the story from the outsider's perspective.The odds were stacked against Max Rosser when he was born sixteen years ago. A month before his birth, his father was put in jail for breaking parole, assault with a deadly weapon and resisting arrest. His single mother was an alcoholic, struggling to keep her job and her home. Already, she could barely take care of eight-year-old Will and twelve-year-old Jon.Max's older brothers hid their mother’s disease from him as best as they could, and they made sure Max had everything he needed to be a normal, well-adjusted kid, despite the fact that they lived at or below the poverty line for much of his childhood. When his oldest brother became engaged to Livvy Holland, the daughter of the richest man in the state, Max befriended her little brother, Trey, and the two remained best friends even though their home lives couldn’t be more different.Through Trey, Max made more friends, including star athlete Callen McNare. Over the years, the boys played team sports, went on group dates, and worked summer jobs together. They became close; closer than anyone would have guessed. Before a real relationship could even begin, Max and Callen were forced apart when their secret was discovered. 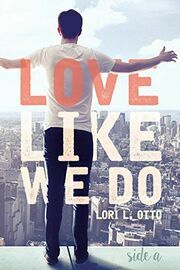 In LOVE LIKE WE DO - SIDE A, family and friends reevaluate their associations with the boys. Callen’s parents are in denial. Trey feels betrayed by his two closest buddies and wonders how their friendship will change. Jon struggles to keep his family together, despite his mother’s devout beliefs and his brother Will’s immoral ways. Interactions with the people around them could bring enlightenment and understanding, or they could keep Max and Callen apart while doing irreparable damage to their families.This is Trey and Jon's side of the story.Cover design by Daniela Conde of DCP Design.